During the late thirties Lufthansa explored the feasibility of launching a regular transatlantic postal and passenger air service utilising the Ha 139 seaplane. The Ha 139 V-1 was the first Deutsche Lufthansa Zweischwimmerflugzeug -twin float aeroplane conceived for the transatlantic mail route. The Ha 139 V-1 was conceived by a Blohm and Voss subsidiary, the Hamburger Flugzeubau (HFB) under the design leadership of Dr. Richard Vogt. The frontal view below enables an appreciation of the aircraft's very distinctive profile with its parallel chord inverted gull wing. 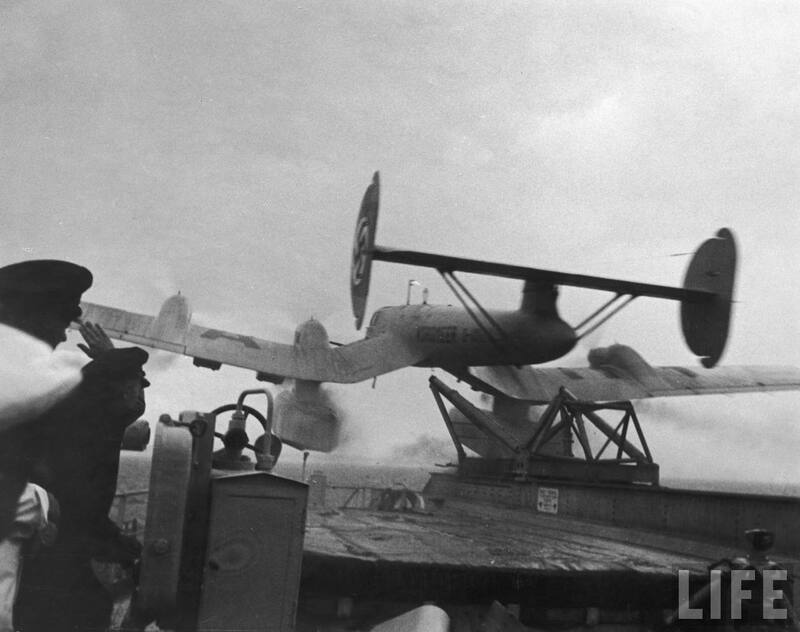 The Ha 139 V-1 , later to be coded D-AMIE and named Nordmeer, was photographed by Life magazine on the catapult of the Schwabenland during testing, probably in the port of Hamburg. The aircraft has yet to have its registration applied. Despite its large size this aircraft could carry 'only' 450 kg of postal freight.
" 24 September 1937, time 06:10 GMT, the place Horta, the Azores - the Schwabenland is steaming full ahead, catapult into the wind. It is still dark, clouds are low and the seas heavy. Ha 139 Nordwind is on the catapult. The crew, Walter Diele from Lufthansa and myself as Kapitän and chief pilot at the controls, run over final checks with the radio operator and flight engineer. On the weakly uv-illuminated instrument panel a bright red light indicates that the catapult's compressed air cyclinder has reached full pressure. After a final check of the instruments and with engines running at full power, the "Klar" signal is given to the catapult operator. The red light goes out. With body and head braced into the seat and arms on the armrests, control column at neutral, we count down the three seconds , "21-22-23" before we feel the punch of the thrust, which, even though expected, still surprises. With a force of more than 4g we are launched into the darkness. As soon as the Nordwind is free of the catapult we lose height slightly, the crests of the waves momentarily visible in the light from the ship. Slowly, slowly the heavily laden Ha 139 climbs for altitude. Soon the first tufts of cloud stream past and over the navigation lights." " Kapitän Diele and myself alternated an hour each at the controls and we had our hands full. Even at 500 metres altitude we were in the clouds on instruments, the automatic pilot disengaged because of the turbulence and strong squally gusts of wind. Flying over the weather was out of the question since our diesel engines did not perform well at altitude. Our radio link with the "Schwabenland" was excellent and plotting our position via their tramissions indicated our heading was correct. 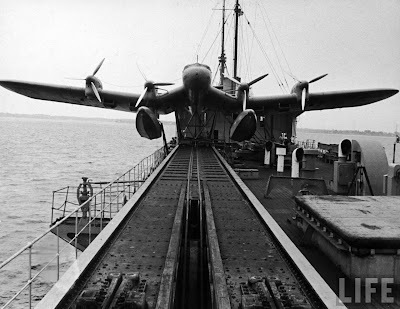 We estimated the winds at gale force eight which were impacting considerably on our ground speed, increasing our flying time and were another reason for maintaining as low an altitude as possible over the waves, taking advantage of whatever 'ground-effect' we could, helping to off-set the headwind. After six hours flying time our flight engineer reported falling oil pressure in engine 3 - here we were, north of the south American shipping routes and well south of the North Atlantic routes - in a completely dead sector- having to stop engine 3. Even the range of our radio equipement was limited here. For some three to four hours neither the "Schwabenland" off the Azores nor the "Friesenland" off Long Island would be in radio contact. Although they had been planned, rescue or weather ships were not yet at sea. We climbed slowly to 1,700 metres on three engines, a height at which we would have more time to take any necessary decisions or sight any ships. The rather tense mood on board finally lifted a little when the "Friesenland" responded to our radio calls. In discussion with them we decided to re-start engine 3 and kept it under close observation. We finally landed at 20:45 GMT after 14 hours and 35 minutes flying time..."
Translated from contemporary accounts for inclusion in the two volumes devoted to Luftwaffe Seaplanes published by Lela Presse. 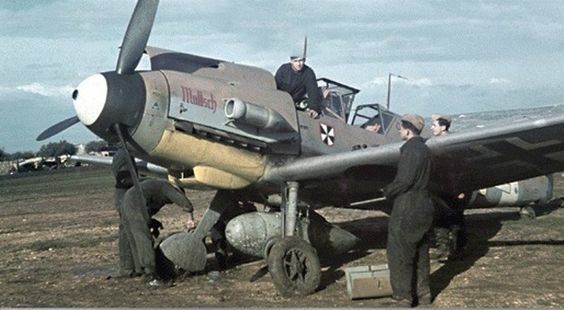 the famous Me 210 " which I so enjoyed flying.."